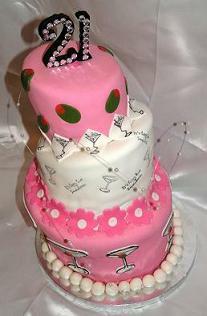 These cake decorating ideas were for a special young lady named Jessica. She was turning 21 and wanted a “WOW” 21st birthday cake to celebrate this occasion. The setting was PF Changs for this birthday party celebration and they wanted the birthday cake to be a unique one of a kind. 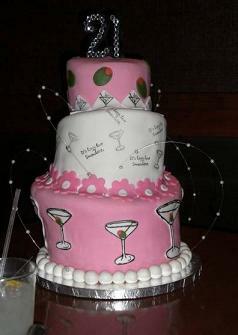 She wanted to go with a cake theme that related to turning 21 and the first thing that came to her was martini glasses. 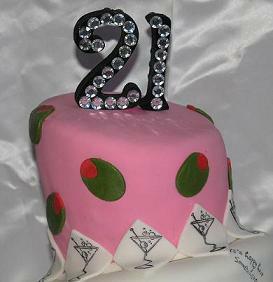 What a great 21st birthday cake idea! The cake flavors were banana, chocolate, and vanilla. We really had fun with this one! I took a wooden stamp of a martini glass and scanned it into my computer. Then I printed out three different scaled sizes. 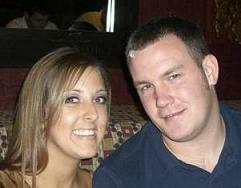 I traced them on to a sheet of wax paper and cut them out. 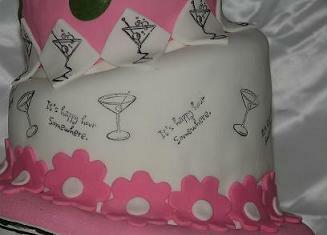 I took the templates and placed them on to the rolled fondant and cut them out. 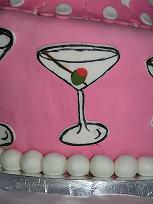 Using black liquid edible gel I painted the outlines of the martini glasses onto the white fondant. For the small olives I colored the white fondant with moss green coloring and used a small oval shaped cut out. Then I took the same cut out and removed just the top piece for the red part. To attach the glass to the fondant covered cake I brushed a little water over the glass so it would adhere to the cake. I use water to act as my glue. I used wooden numbers which I painted and then glued rhinestones to make the 21st birthday cake topper. 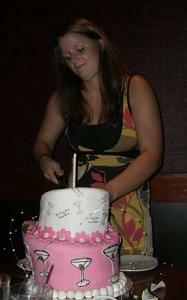 Her friend Brittany finally cut the cake! For the middle cake decorating idea I used wooden stamps from the craft-stamping department and used the edible gel coloring and a little clear vodka, mixed together and it acts as paint. I think it’s quite ironic that vodka is also used in martinis! I brushed the black over a sheet of waxed paper and dabbed the stamp into it like an inkpad and stamped over the white fondant. For the smaller squares with the martini glasses around the bottom of the cakes’ top tier, I used square cut outs and used the same method of stamping. The flowers at the bottom of the second tier were Wilton’s flower cut outs and for the center of the flower I used the smallest circle cut out and also attached with water. It was a very fun cake to make and I would love the chance to make it again or something like it! Thanks Jessica for this opportunity to help make your birthday special and to get to know you and your friend Brittany. She was instrumental in coordinating the delivery and staying in touch and helping with this cake decorating idea! E-mail Steph your cake decorating ideas for your next birthday occasion!